Most mobile and distributed applications have an API to easily plug into and almost every application uses at least one. Everyone is doing it! But, not everyone is doing it right. Creating a rich API that can be easily scaled requires some planning and thinking. Most APIs developed these days, once deployed, can't be changed. Doing so usually results in breaking the client's code that rely on the API. While it's a good thing to remain consistent, we should give our APIs room for extension. We believe API design should follow an open/closed principle which states "software entities should be open for extension, but closed for modification." Applying this principle will help your API evolve as the industry changes. Here are some of the best practices and pitfalls we've discovered to help you build a great API yourself. Developers may be tempted to be as descriptive as possible when structuring API resources. Take for instance the table above. Depending on how big your application is, using verbs will result in a huge list of URLs. It’s hard to keep track of such a list as a developer, but it’s even harder for your API consumers as they will need to dig into the documentation for every task. An API should be designed in such a way that users can guess or experiment successfully with the URLs. Above is an example of how we can structure our resources better and make the API easier to use. We only need two resources, /photos and /photos/:id in conjunction with four HTTP verbs (GET, POST, PUT, DELETE) to be able to perform the operations in our previous huge list. Another bad practice is querying the database and dumping everything out as an API response. Instead, I do strongly recommend the use of transformers over just dumping the database data to the world. Transformers give you control over what data you actually output to your API consumers. With transformers we are certain that sensitive information is not displayed by mistake. Not only is it a security measure, transformers will help prevent API consumers code from breaking when your database schema changes. While you can build your own transformers easily, I recommend Fractal (http://fractal.thephpleague.com/) if you are in the PHP world. With transformers you are afforded the benefit of serializing your data in a specific way, as well as embedding related resources within each other. 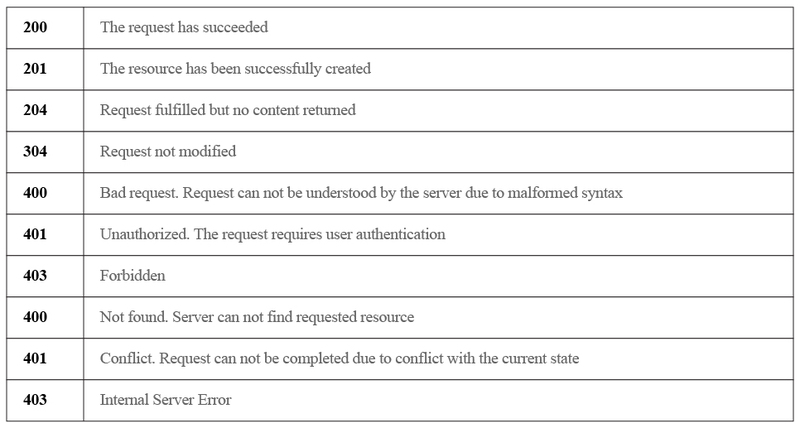 So don’t just return HTTP status code 200 for every request. Apart from returning the correct HTTP status codes, it also helps to return custom error codes and verbose error messages for your API. These will go a long way if you have to offer support to your API consumers. Knowing the error code and message will make it easy to pinpoint the issue in your code. Including usage examples and tutorials will be a plus. Another important aspect in API design is authenticating and protecting our applications. Below are some strategies that you can use to authenticate clients who use your API. This is a standard HTTP authentication mechanism whereby clients supply username and password BASE64 encoded in the “Authorization” header. However, since this involves transmitting access tokens and authentication credentials Oauth2 is only secure if used with TLS/SSL to encrypt data during transmission. You also, need to put into consideration storing the client credentials on clients like mobile applications. There is a debate about this as storing the credentials for Oauth2 on a mobile or desktop app doesn’t seem to be the most secure thing to do. If for instance, our client credentials get compromised, then the Oauth2 provider has to revoke the entire applications since we would have that information hard coded. We have only scratched the surface here. There are a lot of techniques that we could talk about to make our APIs scalable and secure.